Love soulful, soothing gospel classics? Five of today's most popular southern Gospel artists reunite for the first time in almost two decades to celebrate the legendary award-winning Cathedrals. Past members Ernie Mark Gerald Scott and Danny gather around the piano for a LIVE concert that pays homage to heroes George Younce and Glen Payne and to the group's legacy. Featuring many of The Cathedrals' classic hits and four-part harmonies this recording captures all-new vocal performances heartfelt stories and special memories of an era that changed countless lives through the power of Gospel music. Cathedrals Family Reunion: Past Members Reunite Live In Concert by Cathedrals was published by Capitol in November 2015 and is our 2136th best seller. The ISBN for Cathedrals Family Reunion: Past Members Reunite Live In Concert is 0617884901523. 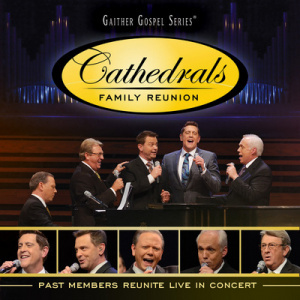 Be the first to review Cathedrals Family Reunion: Past Members Reunite Live In Concert! Got a question? No problem! Just click here to ask us about Cathedrals Family Reunion: Past Members Reunite Live In Concert.